Instagram, a social media app, is becoming increasingly popular as a business and communication tool. Analyzing 12 posts on Dunkin' Donuts' Instagram account, this case study attempted to understand branding through framing theory. The study found that Dunkin' Donuts used its brand name, logo, colors, and images of its products on Instagram to create a strong brand presence. But the company failed in creating an image of its brand as being people-oriented because it scarcely used text, photos, or videos to represent its fans or involve them. In recent years, social media has become increasingly popular as a business and communication tool. Businesses are recognizing the importance of social media as a way to engage with consumers on a more personal level while being able to implement marketing techniques and further the brand image. In a world of social engagement and connectivity, many well-known brands are using social media to reach and engage their consumers by sharing great content. One of the newest social media tools available to brands is Instagram, a mobile app that allows users to capture and share images and videos with followers (Instagram, 2015). Officially launched in October 2010, Instagram gained 1 million users within its first month, and the app had 300 million active monthly users by April 2015 (Costill, 2014; Instagram, 2015). As a largely visual social media tool, Instagram allows businesses to reach consumers and strengthen its brand in new ways. 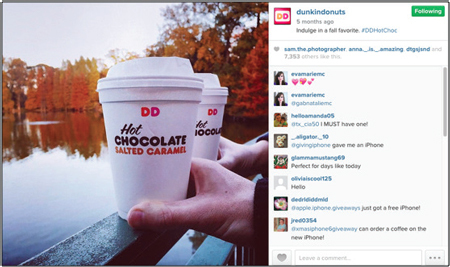 This case study aimed to discover how Dunkin' Donuts used Instagram to strengthen their brand. This study analyzed Dunkin' Donuts' Instagram account to determine the strategies and elements used to strengthen the brand, attempting to discover if there were frames used by the company on the social media platform. The author reviewed literature related to the four integral elements — framing theory, branding, Instagram, and Dunkin' Donuts — in order to provide the background necessary to understand the topic of the paper. The purpose of this study was to discover if framing was at work in the company's social media strategy by examining the branding of Dunkin' Donuts using Instagram. Framing theory is based on the idea that "an issue can be viewed from a variety of perspectives and be construed as having implications for multiple values or considerations" (Chong & Druckman, 2007, p.104). Chong and Druckman defined framing as "the process by which people develop a particular conceptualization of an issue or reorient their thinking about an issue" (p. 104). In the field of communications, framing theory provides meaning to events or issues by organizing "everyday reality" (p. 105). The theory shows how mass communication influences individuals and the social world. One important aspect of framing theory is that it implies relationships among the elements of a message because a communicator organized the message (Baran & Davis, 1995). Frames are important in communications literature because they help researchers identify trends, compare media coverage, and examine the variations of messages across media (Chong & Druckman, 2007). Frames also help communicators understand the way in which companies brand themselves. Understanding framing as a relationship among elements of a message relates to how companies brand themselves in traditional media and in social media. Framing has been used as a theoretical basis for many studies involving media and media effects. This type of literature has focused on framing in terms of how media present current events. De Vreese, Jochen, and Holli (2001) studied the framing of news surrounding the adaptation of the euro as a common European currency. By focusing on both media and audience frames, the researchers were able to determine there were variations in media coverage of the event in different countries, with journalists more likely to emphasize conflict rather than framing it as political or economic news. Other framing research has been based around understanding the theory itself and its place in media research. Weaver (2007) discussed framing theory and its role in communication research. He found that framing studies were the most popular type of theory indexed by Communication Abstract from 1971 to 2005, but were the most abstract. Future research, he concluded, should make an effort to define frames and framing more clearly to help conceptualize the theory. Researchers can examine variations framed in messages in small stories individually and understand the meaning of issues throughout the stories. This means that framing can be analyzed to study branding on social media by looking at the variations of messages on social media to understand the brand as a whole. McClain (2011) used framing to understand branding in social media. Used framing theory to analyze the framing of news on Twitter, Wasike (2013) wrote, "In a broad sense, framing refers to the selection of certain aspects of reality in order to make them more salient in a bid to promote a desired interpretation" (p. 9). This idea shows that scholars can study the aspects that were chosen to appear on social media sites as explicit choices with desired interpretations and uses to understand branding on Instagram. Another pertinent study of framing theory, which is related to advertising message construction, is the Message Framing for Brand Communication model (Tsai, 2007). 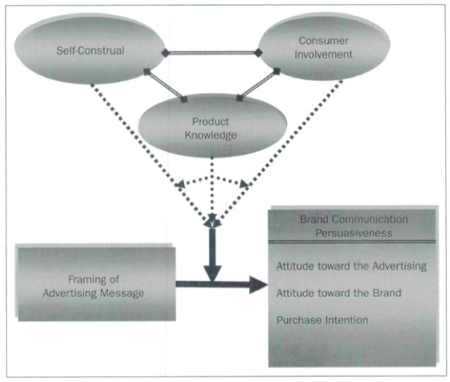 The model in Figure 1 shows that selfconstrual, consumer involvement and product knowledge are all factors that determine how effectively the framing of a message will influence attitude toward the advertising, the brand, and purchase intention. Tsai (2007) proposed two main frames for advertising: positive and negative framing. Positive framing focuses on the positive outcomes of the product brand, and negative framing focuses on moving away from negative outcomes of the product brand. Positive framing, for example, would exist in a meat product brand advertised as 75 percent lean, while negative framing in the advertising would say 25 percent fat (p. 364) so that consumers would be motivated to become active against a competitor's brand. The goal of branding is to create an emotional connection between a company and its consumers. Branding results from the sum of many different parts, including the brand name, logo, colors, and more. It allows companies to differentiate themselves in an increasingly crowded market. The rise of new technology is changing how companies communicate with consumers and in turn how they use branding. Research on building or maintaining strong brands available to communicators is considerable. Keller (2009), for example, studied new challenges for marketers when it comes to building and maintaining brands. The author proposes a customer-based brand equity model in order to address how brands can be built and maintained through consumer knowledge structures. The model discusses a rational and emotional pathway that consumers may feel when becoming connected to brands. 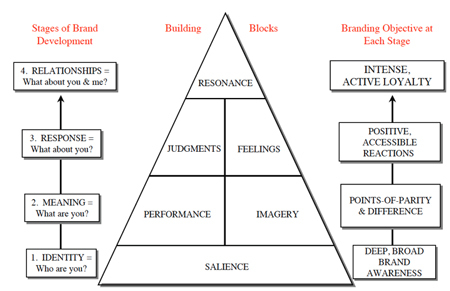 The pyramid model, in Figure 2, features the six brand building blocks, brand salience, performance, imagery, judgments, feelings, and resonance (p. 143). According to the study, these building blocks are necessary to create a connection between a brand and a consumer, in both a rational and emotional way. Other research studied the role of social media in branding. In "Social Media's Role in Branding: A Study of Social Media Use and the Cultivation of Brand Affect, Trust, and Loyalty," North (2011) used cultivation theory as a framework to check if social media impacted advertising outcomes. The research found that a correlation is present between social media use and brand trust and loyalty, linking social media and branding. This study sheds light on the importance and necessity for more research on brands' presence on Instagram. When studying Instagram, it is important to consider the visual aspect of the social media app. In a thesis titled "Get Schooled: A Visual Social Semiotic Analysis of Target's Branding using Instagram," Bevins (2014) used the theory of visual social semiotics to examine Target's Instagram to "optimize [the] understanding of visual information" (p. 12). Although the Target study focused on one specifi c back-to-school campaign, its research framework can be applied to the case study of Dunkin' Donuts Instagram account. 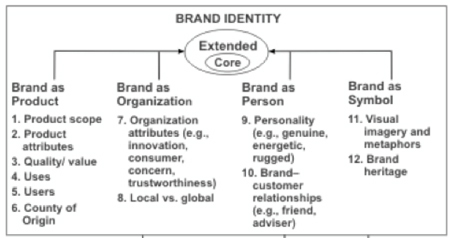 One theoretical perspective that this paper's author adopted was Aaker's Building Strong Brands Model for the Brand Identity System, which emphasized four different aspects of brands, as shown in Figure 3. Brand as product, the first element of brand identity in Figure 3, represents the role of product in building a consumer's association with a brand. Brand as organization emphasizes businesses' focusing on their organization's attributes for branding instead of their product or service attributes. Brand as person also helps consumers relate to the brand personality. Symbols, the final element in the model, provide a visual to the consumer and also drive the meaning behind the brand (Bevins, 2014). In order to establish a framework for analyzing the Dunkin' Donuts Instagram images, the author consulted visual branding literature and created a list of elements that build a strong visual brand. A blog on Hub Spot featured the "4 Ingredients of Social Media Success," which can be used to strengthen brands' social media presence (Perkins, 2014). The most important tip for branding in this article was a consistent color palette: using the same colors over and over again, whether they are applied to the logo, text, or images. Two to four colors were recommended to be used consistently throughout social media posts (Perkins, 2014). Another article from American Research Group, Inc. (2012) provided 10 rules for effective advertising, which could be applied to social media use by brands. These 10 rules were phrased in the form of questions, such as "Does the ad use basic emotional appeals? Does the ad make the desired call to action a part of the story? Does the ad use symbolic language and images that relate to the senses?" Next, a 2015 blog on WordStream.com created a list of 10 marketing tips to build a brand on Instagram, providing tangible, observable aspects. The first tip is to build community around an actionable hashtag. A hashtag is an important part of the Instagram experience. It allows users to find images related to a company of their interest and to tag and post their own user-generated content on Instagram. An actionable hashtag makes it easier for a brand to interact with its consumers. The second tip is to find the beauty in the portrayal of a brand (da Cunha, 2015). The way in which a brand portrays its products can play an important role in the branding process and may contribute to the framing of the brand on social media. Finally, Instagram itself offers advice for visual branding. On its company blog, Instagram recommends that its users creatively use the app as a "Canvas for Seasonal Creativity" and upload various seasonor holiday-related images to the app. Businesses can embrace this idea for visual branding ("Instagram For Business," 2014). Research on social media as a business and communication tool has seen significant growth in the past decade. Much research has been conducted on the subject, including one discussed in the branding literature above, titled "Social Media's Role in Branding: A Study of Social Media Use and the Cultivation of Brand Affect, Trust, and Loyalty" (Bevins, 2014). The study examined whether or not social media was able to influence people's brand perceptions. The results of the research indicated that a correlation existed between social media use and brand loyalty, with age also playing a factor. The findings of this social media branding research shows that there is, in fact, a link between social media use and branding. While there is much research about social media itself, Instagram research is still a new topic. Some research focused on Instagram as a social media tool. For example, a paper titled "How Instagram Can Be Used as a Tool in Social Network Marketing" discussed the ways in which Instagram can be utilized to promote brands and maintain relationships with customers. The research also examined how the platform was favored among users as a largely visual medium in which consumers could interact with the brands they follow (Huey & Yazdanifard, 2014). Other Instagram research has focused on understanding what type of content users upload on Instagram. For example, Hu, Manikonda, and Kambhampati (2014) studied Instagram through an analysis of photo content and user types. They clustered a sample of 200 photos uploaded to the app by everyday users and created an eight category-coding scheme, against which photos were analyzed for content. These categories included friends, food, gadget, captioned photo, pet, activity, selfie, and fashion. This study found what content users posted to Instagram and what types of content were the most popular. According to Fast Company (2014), Dunkin' Donuts, and its main competitor, Starbucks, own half of the United States coffee market, with Dunkin' Donuts owning about 24 percent. In 2013, Dunkin' Donuts owned 11,000 restaurants in 33 countries and sold approximately 18 billion cups of coffee a year. Both companies are social media giants, with millions of followers and a large presence on the main social media sites of Facebook, Twitter, and Instagram. But while Starbucks focuses on a more serious and focused target audience, Dunkin' Donuts targets a fun and casual coffee drinker. Dunkin' Donuts highlights its friendly brand identity with a distinct pink and orange logo (Champagne & Iezzi, 2014). Our social media strategy is aimed at growing and maintaining a highly engaged global community of Dunkin' Donuts fans. We work to consistently provide meaningful content and promote a twoway dialogue between the brand and our passionate fans. We're a fun brand, and our guests who rely on us for coffee and donuts expect a little fun from us by making Dunkin' Donuts part of their daily lives, either through status updates with pictures or questions or with fun challenges and sweepstakes tied to our marketing calendar initiatives (Sohn, 2012). On . . . Instagram, we're creating and sharing content based on how Dunkin' Donuts fans are already engaging with the brand on these channels as our way of celebrating what makes them special and keeps them running. We also want to surprise and delight them with unique Dunkin' Donuts content through special images and boards dedicated to what's going on in our office, or by sharing special, one-of-a-kind donuts at our restaurants around the world (Sohn, 2012). Dunkin' Donuts Instagram strategy is designed not only to engage fans, but also to provide content they are generally interested in through unique, joyful, and fun content. Based on the literature review, one research question was asked for this paper: How does Dunkin' Donuts use Instagram to brand itself, especially using framing theory? To gather a systematic sample of posts from the Dunkin' Donuts' Instagram account, the author chose a time frame of one year, from April 2014 to March 2015 and selected one post from each month of the year. The first post from the first sample month of April 2014 was selected, followed by the second post from the second sample month of May 2014, and so on. This process produced 12 posts when the 12th photo was selected for the 12th sample month of March 2015. Instagram posts were divided into the categories of textual elements of captions and visual elements of pictures and videos. The former is composed of hashtags, brand name, product name, a call to action, and season or holiday. The captions were analyzed to see whether they were positively or negatively framed. Visual analysis looked at several categories, such as type of visual, name, logo, color, products, season or holiday, emotional appeal, food, people, activity, and fun/friendly imagery. The author first described two posts as an example below and further analyzed all 12 posts later. The post below from May 2014 is 1 of the 12 sampled posts (Refer to Figure 4). The caption beside the image mentions the holiday Cinco de Mayo, a call-to-action verb with "Start your fiesta" as well as the Dunkin' Donuts brand name in "DDs." A Coolatta is a Dunkin' Donuts product name and its price is featured. This example shows how Dunkin' Donuts incorporated its textual elements as a crucial part of the branding process. 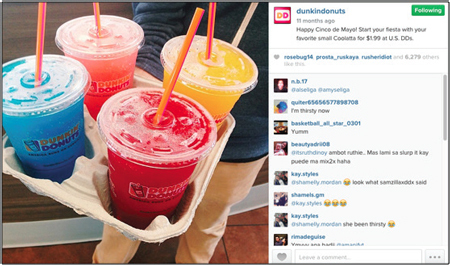 Another post below features a sample image from Dunkin' Donuts' Instagram page (Refer to Figure 5). This image features fall imagery in the image of colorful leaves and the lake. The post also features a textual call-to-action using the verb "indulge." Finally, this caption also mentions fall as well as the brand name and brand product in the hashtag #DDHotChoc. Among the 12 posts, 6 (50%) mentioned the brand name in their captions, either in their comments or hashtags, or in both (Refer to Table 1). 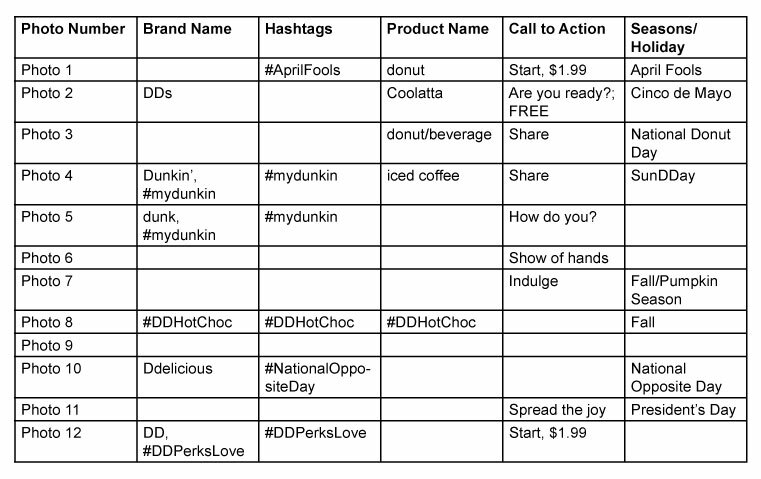 Four out of the six hashtags refer to Dunkin' Donuts name — two #mydunkin hashtags and two different hashtags including #DD. A Dunkin' Donuts product name was mentioned fi ve times: two references to donuts in general, once to iced coffee, and twice to the specific products of Dunkin' Donuts' Coolatta and Hot Chocolate beverages. In the text, call-to-actions were used in eight posts. The most common verb used was "share," written twice. Other call-to-action verbs included "show," "indulge," and "spread the joy." Two questions were also used in the comments. Price was mentioned twice: $1.99 for a small Coolatta beverage and a free donut with the purchase of a beverage. Eight posts mentioned seasons or holidays: Seven of the mentions were specific holidays, including April Fools Day, Cinco de Mayo, National Donut Day and President's Day. There were two mentions of the season fall and one mention of SunDDay, a nomenclature for Sunday created by Dunkin' Donuts. Analyzing captions based on the branding and advertising framework of positive versus negative framing, the author found all captions used a positive frame, except for one post for April Fools Day. In this negatively framed post, the caption says, "#AprilFools Day is all fun and games until someone wastes a donut." The other photos were all framed in a positive way, calling for fans to share stories and pictures, buy products, and continually engage with Dunkin' Donuts as a brand. Of the 12 Instagram posts, 11 posts featured still images and 1 post showed a video. Next, the analysis was focused on the appearance of the brand name, logo, brand colors, and products in the Instagram units. The Dunkin' Donuts name appeared in six posts, usually appearing as part of a product package, whether a donut box or a coffee cup. Some coffee cup images, however, did not have the Dunkin' Donuts name. Two types of the Dunkin' Donuts logo appeared in the posts, as shown in (Figure 6). The first type of logo appeared in 6 posts; the second logo, which is also used as Dunkin' Donuts' Instagram profile picture, appeared in 4 posts. The brand colors of orange and pink appeared in 11 posts. These colors appeared in the logo as well as food and beverage packaging and as bold text featured in an image. Dunkin' Donuts product images were also largely featured on Instagram: Dunkin' Donuts coffee (six times), donuts and pastries (twice), and both coffee and donuts (twice). Prominently featured products were the Dunkin' Donuts Coolatta, iced coffee, and the Dunkin' Donuts line of pumpkin fl avored beverages, such as the Latte Pumpkin Crème Brule, Iced Latte Pumpkin Mocha and a pumpkin muffin. Baran, S., & Davis, D. (1995). Mass communication theory: foundations, ferment, and future. Belmont, Calif.: Wadsworth Pub. Bevins, C. (2014). Get Schooled: A visual social semiotic analysis of Target's branding using Instagram. Master's thesis. Retrieved April 20, 2015, from http://digitalcommons.liberty.edu/cgi/viewcontent.cgi?article=1329&context=masters. Chong, D., & Druckman, J. N. (2007). Framing Theory. Annual Review of Political Science 10, 103-126. Retrieved from 10.1146/annurev.polisci.10.072805.103054. Hu, Y., Manikonda, L., & Kambhampati, S. (2014). What we Instagram: A first analysis of Instagram photo content and user types. In ICWSM. AAAI. Retrieved April 20, 2015, from http://149.169.27.83/instagramicwsm.pdf. Huey, L. S., & Yazdanifard, R. (2014). How Instagram can be used as a tool in social network marketing. Master's thesis. Retrieved from http://www.academia.edu/8365558/How_Instagram_can_be_used_as_a_tool_in_social_network_marketing. Wasike, B. S. (2013). Framing news in 140 characters: How social media Editors frame the news and interact with audiences via Twitter. Global Media Journal, Canadian Edition, 6(1), 5–23.